Hey! Parents! Leave your expat child’s stuff alone! I have been having a little frenzy of tidying over the past few weeks. Piles of toys, outgrown clothes, unloved teddies, random art-work….some days I feel like the house is going to collapse under the weight of all the “stuff” my children seem to collect. It’s just “stuff” to us but to them it is their history…. But when it comes to throwing it out – or giving it away – I have a problem. Not only do I have to contend with the girls’ pleas not to get rid of their once-favourite t-shirt or that unopened game they may get round to playing at some point, I also have a little voice in the back of my own head saying: remember how it felt when you were a child? What DID happen to that stuffed hippo? And have you ever really gotten over having your collection of china animals whisked away the moment you left home for boarding school? But although parents everywhere go through this exact same battle with their kids – what to keep, what to get rid before the stuffed toy collection takes complete control of their bedroom – there is a difference for us expats. Because whilst other children will have continuity in their house, their friends, their schools, their playgrounds and so many other things, those stuffed toys and random bits of rubbish we could so easily sweep into the bin are the very things that help our children with transition. Take my youngest daughter, for example. When we arrived in Pretoria just over a year ago we brought with us in our suitcases a set of beautiful fairy lights made of delicate pink roses. She had them hung around her bed at home and used to go to sleep with them turned on (much to the annoyance of her older sister who at that point was sleeping in a bunk bed above her). The first night in our new house we strung them up around her bed and switched them on. She was able to go to bed with something that made her feel immediately familiar. It probably didn’t stop her coming in to us in the night anyway, but it was a start! Now, those fairy lights have stopped working. They are looking distinctly bedraggled and so many fuses have blown they don’t work anymore. We were cleaning out her room the other day, sticking some pictures on the wall and sorting out her books. She fingered the fairy-light roses, still delicate but now not quite so appealing. She started to say she wanted to get rid of them but hesitated. Then said no she would keep them for now. I could tell she couldn’t quite move on yet. Now I could have insisted we get rid of the lights – along with the piles of c**p that stack up on her shelves, in her cupboards, by her bed….but actually when we have taken everything and everyone else away who are we to also take away the things that gives her her identity? The bits of paper with funny little drawings on? Reminds her of the time she and her friends played schools in Year 2. The 45 various stuffed toys? Each one has a history, a place in her heart. The old school books? She looks through them from time to time and it connects her with her past. It’s pretty hard being an expat child and if one thing we can do for them is let them keep their stuff then let’s do it. One of the most heart-rending sections in my book, The Expat Partner’s Survival Guide, was a section written by an expat child herself. In it she describes never being able to decorate her room the way she wanted, not having those marks on her wall which show how she has grown. It is a plaintive cry from the heart for a permanence she will never know, and which my own children may also now never know. We all hope that what we are giving them will outweigh what we take away but at this point, in this moment in time, sometimes it is hard for our little ones to recognise this. So leave their stuffed animals. Don’t throw away all the old drawings. Ignore the books you think they will never read again. It may seem like rubbish to us – but to them, it is the home they carry with them. I’ve been in Pretoria for six months. Six months and four days, to be precise. I didn’t actually notice on the day we reached our six-month milestone – we are so busy and wrapped up in our life here, it passed me by completely. Which has to be a good thing! No-one’s first half year in a new country is all sweetness and light, and I have had my fair share of downs as well as ups. On the whole though, I think I have got off pretty lightly in the “difficult first six months” department, certainly compared to other places I have lived. Looking back, it seems incredible that only six short months ago I felt like the helpless toddler that I described in this post – Starting expat life: feeling like a child again. Or even the pre-teen I was when I wrote this post, three months later: How far I have come. You can get used to living with a high level of personal security. I don’t really think twice now about all the keys, padlocks and bolts we have to open and close to get in or out of the house. I automatically lock my car doors every time I drive anywhere. I am always aware of who is around me, and if a car is acting suspiciously on the road behind me. I never have my handbag open, I put money away when I get it out from the ATM before walking away. You do have to live in a sort of state of high alert all the time, but it doesn’t ruin your life. Having said that, one of the things I am most looking forward to when I return to the UK for a holiday is walking out of my front door at night, simply closing it behind me, and walking…. A GPS is a damn fine thing – it brings you freedom in a way no map can. Up until now I have eschewed these relatively new items of technology: early experiences with one back home in the UK when they were still called SatNav’s were not good: they fell off the window; you could never get a signal; they took you down ridiculously narrow roads leading nowhere. But here they have been a revelation – allowing me to go anywhere I wish, knowing that not only will “James”, “Kate” or “Sarena” get me there, but they will help guide me home too. I love my GPS so much I even wrote a whole post about it. Culture shock comes in many guises. I think I have suffered more from the differences in the school community we are now part of than in the differences of South Africa itself. The school is an American international school so we are having to learn about a whole new curriculum and a whole new way of doing things. Many of the frustrations I have felt since arriving here have been directed at the school. That isn’t to say I haven’t felt culture shock in other ways and places, but perhaps this was the least expected. I’m not sure yet where I am in the culture shock “cycle” with the school but I would guess somewhere between negotiation and adjustment..
South African politics and race relations has to be one of the most complicated in the world. You think you know a place….and then you move there. We all followed what was going on here durning the Mandela years, followed his release from prison, the election that brought him to power….and then so many of us stopped watching. I think we thought it was all resolved and everyone would live happily ever after. Of course, something like Apartheid is going to leave a massive legacy that is going to take decades, if not centuries, to unravel. There are problems on all sides of the political spectrum and underlying everything is the question of race. Never have I felt so aware of my skin colour on an ongoing, daily basis. As an outsider it is fascinating. But for the average South African there are difficult times ahead. I hope the “rainbow” nation holds together as when it works, it truely shows the world how things can be done. Laundry day in Soweto – the racial divide is alive and kicking in South Africa, although the antics of the ANC government mean things are not as straightforward as they seem…. It doesn’t matter if you live in the most wonderful place in the world and go on the most incredible trips every few months – your children will still be children. They will still have tantrums even on safari. I know this from (bitter) personal experience. Living without airconditioning when it is 43 degrees isn’t much fun. Again, bitter personal experience. All Netflix’s are not created equal. There is Netflix UK and there is Netflix US and then there is Netflix SA. We got all excited when Netflix SA arrived and joined up to see what it was all about. On recommendation from friends, we got stuck into Narcos – which, if you haven’t seen it, is excellent. But knowing it would come to an end pretty soon I started asking around to see what other shows people would recommend. The suggestions came in thick and fast, mostly from my friends in the UK. I got all excited, thinking that for just a fiver a month we would be able to watch all sorts of fabulous shows. Only to find out that you can’t get most of them here in South Africa. Ah well, back to the drawing board it is then (luckily the local TV service DSTV actually has some pretty good shows and we are currently getting into Billions and the second series of the Leftovers). There are, of course, many others things I have learned since living here. I know the sound of a displaying weaver bird. I recognise when a huge black cloud means hail, and when it means just rain. I understand a bit more about what happened during the Apartheid years, and why there is a whole generation here whose education was messed up. I know which shops I need to go to for cleaning products, and which for food. I even know where to get the best type of puppy food (less than four weeks now until the puppy arrives!). However, there is – of course – still a LOT that I don’t know. A HUGE amount. And so I start the second six months of our time here with lots of unanswered questions: why DOES the weaver bird keep destroying his beautifully crafted nest? Who WILL people be voting for in the next set of elections? Just how cold DOES it get in the winter here? How likely AM I to see whalesharks in Mozambique???? Yup, the next six months look like they are going to be as much fun as the first. How do we protect our expat children? I attended an interesting workshop this week at my children’s school on the topic of bullying. This is obviously a subject that all schools have to deal with, whatever type of educational establishment they are and wherever they are in the world. But being an international school there were some issues – not all of them related to bullying – that came up that are perhaps more unique to our children and which have really started making me think. It’s pretty tough for our kids. First of all, we drag them away from their friends, family, school, home, possibly even pets, and take them somewhere completely new. Often they have had no say whatsoever in this move but it has been presented to them as a fait accompli. Of course many of those whose lifestyle has been a global one ever since they can remember will be aware this is coming and be prepared for it. Nevertheless, any international move is always going to take its toll on a youngster (not to mention the rest of us!). So they get somewhere new. They start a new school, they make new friends. And then the next thing they know, those new friends start leaving. So they feel the wrench again. And again. And again. Life at an international school is often one leaving party after another. And that can have quite an impact on someone – especially an emotional teen. International School life – it can be fun, but it can also be tough. The reason this came up in the bullying workshop was because one of the signs that someone was being bullied, so we were told, could be that they told you they had no friends. But one of the mums pointed out that with five children having just left her daughter’s already pretty small class, it was quite possible that she really did have no friends. It really brought home to us all how difficult this life can be. One of the teachers running the workshop has had a lot of experience in international schools and she had some good tips on how to help our children deal with this sort of constant emotional pounding. First of all, she said, acknowledge with yourself and with your child that this is part of international life. There is no getting away from it, friends will leave. If you are lucky you may have one or two that stay for the duration of your assignment; but at some point either you will go – or they will. This is part of your life now and as a family we have to accept it. There is no point in pretending it isn’t going to happen. Secondly, she said, let them know that you also feel this way. You are sad too when friends leave, you miss home, some days you may want to leave. Talk to them about culture shock in an age-appropriate way and – if they are struggling at the beginning of your time in a new country – assure them that things will get easier over time. Although we didn’t dwell on this topic for too long as we were straying from the main subject of the workshop, enough was said to make us all realise that this is an issue that we all needed to tackle. As well as the tips from the teacher, I also think it is worth talking about technology and how we can continue to keep in touch with friends even after they have left (or you have). Just because they are in another country doesn’t mean you will never speak to them again – or even see them. The world is a shrinking place and you never know who you will bump into in the future. And of course think about all those wonderful places you will have to visit in the future! There is a lot more that I could say on this topic, but there is also a lot more already written. So to finish I want to share a few links to other sites that you may find useful. Firstly is the Expat Child website, which has sections focusing on the different age groups (although I found the 9-12 year old section a lot more relevant for my 8 year old than the 4-8’s section). Here, for example, is one article from the site about Expat Child Syndrome. Then there is a website called International Family Transitions, which includes a number of articles and links on the subject of moving with children. And another interesting expat website, Expat Family Health, has this article on Helping Your Child Adapt Abroad. Finally, if you haven’t already seen it, the Pixar movie Inside Out is highly appropriate for families moving overseas (although the film is actually about an American family moving to another state within the same country). You might want to think about when you watch it with your kids – eg possibly not just after you have arrived somewhere new and they (and you) are feeling particularly emotional. But it can be a great way to open up discussion about the move. Do you have children at an international school? How have you helped them cope with the constant comings and goings? Or perhaps you were an international school child yourself – if so, how did you feel when friends moved on leaving you behind? All around the expat world this cry goes up at least once a year. Or at least, it does in British households. Where we have no national costume. Our International Day is on Friday and it will be the first I have had to endure plan for since I myself was a child attending the International School of Manila in the Philippines. There weren’t a lot of Brits at the school in those days – we were outnumbered by the Americans and then by Australians/New Zealanders and Asians. So we were always a small group traipsing around the parade ground – although our numbers were slightly bulked out by the fact that there were four of us children in our family. But every year we had the same dilemma. What on earth were we going to wear? All these years on, I actually have no recollection as to what we actually did wear in the end – although I know friends of ours cheated slightly and wore Scottish kilts. Even though I don’t think they had a drop of Scottish blood in them. But at least their costumes were recognisable. What gets me is those countries that have these amazing, beautiful national costumes. It just doesn’t seem fair that some children get to dress up like goddesses – and we have what? Raincoats? Some would say though that this means we just have to be a bit more…imginative. And I know from previous discussions in a Facebook group this has led to children being dressed as punks, Harry Potter, Victorians, Tudors….in fact – here’s a thought! Maybe we should just recycle some of the outfits we used for those endless dress-up days back home, where one daughter was a young Edward VI and another a poor Victorian child in her nightdress. Is this traditional British dressing up? Instead though we will be doing what I suspect many of my fellow English parents do all around the world and resorting to national colours or flags. We have a “Geri Spice Girls” Union Jack dress left over from a hallowe’en that we accidentally ended up in Florida for one year (a long story – maybe it will make it on to this blog one day as a Memorable Journey post). My youngest still fits into this so that’s her sorted. As for the older daughter, I dug out an old “England” t-shirt from one of the various football tournaments we have failed to progress in over the years which now seems to fit her. We also have a large England flag from the same event. My only worry is, wearing an England shirt and carrying an England flag does have underlying associations with football hooliganism. Which actually…..now, there’s an idea….. So how about you? Got an International Day coming up? Have you had to come up with any ingenious solutions to dress your child in? Or do you come from one of those smug countries with its own national costume? Last weekend was a weekend of parties. My elder daughter attended one on Saturday and my younger daughter went to two on Sunday. I was Mrs Taxi Driver all weekend, although I did get to meet some new people and have some fun chats with other parents, so all happy. However, what these parties did bring home to me is what a potential mine-trap parties can be when you are new to a place and don’t know how others do it. In our case it’s not so much the South African culture we have to worry about as the girls go to an International school and have friends from all over the place. But there is still a collective “knowledge” of how things are done – and the fear is that you will just get it plain wrong. first of all – who do you invite? Just a couple of friends? The whole class? The whole YEAR group? do you leave your children at the party? If you do, will anyone be looking after them? if the parents stay, will they expect to be fed? if the parents leave, will they be back on time to pick them up? Will they even actually come back at all (and yes, this has happened to us – in St Lucia). So whilst an earlier post I wrote about birthdays was whether we would have any friends to invite to my daughter’s 10th birthday party in a couple of weekends time, now my worrying has reached a whole new level. Add to the above things like how much food is expected, will we have to do party bags and will those guests who haven’t replied to the invitation turn up anyway? On top of this, we have had to battle venue issues (what sort of place was available? When we found somewhere, we had to book the food separately from the activity…); payment issues (they wouldn’t take an online credit card payment; we couldn’t pay direct into their bank account because we don’t have a bank account in the country yet…); and cake issues (where can I get one???? I can’t make one even if I wanted to – my baking equipment is still on the high seas….) and it’s left me feeling quite weak and in need of a llie-down instead of pumped up and ready to celebrate! But in the end I decided that as this WAS such an international enviroment actually everyone would probably do it differently anyway. So we’re doing it the way we would back home (except we are inviting more children than we would – as she doesn’t yet have one or two “best” friends). We’ll only cater for the invited guests. Parents can look after themselves. I won’t encourage extra brothers or cousins to stay. We probably won’t do party bags but will send them home with some cake. And I will assume that only those who have said they will come will, actually, turn up. It could be great…..or it could be a total disaster! 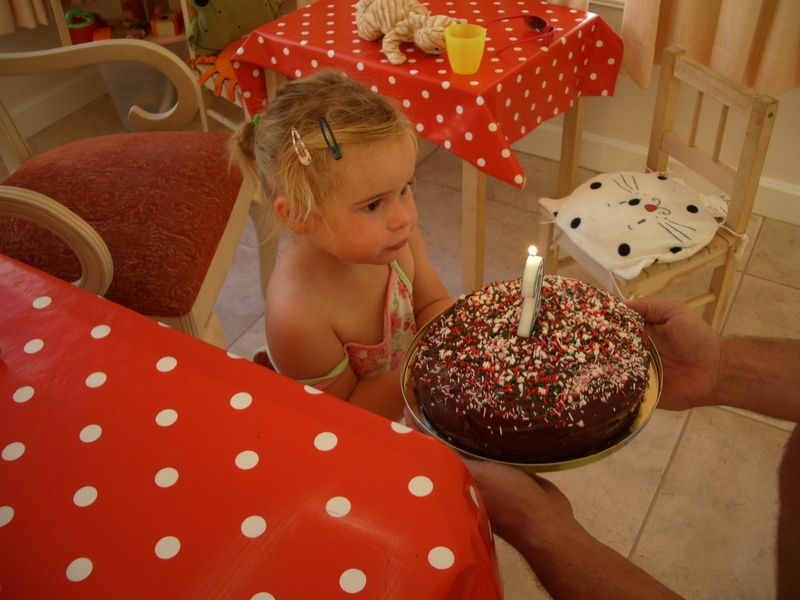 What birthday party cultural clashes have you encountered? Have you made any major boo-boo’s – and if so did you manage to cover up any faux-pas’? Do share your stories, it’s always good to know we’re not alone stumbling crazily through this expat life!